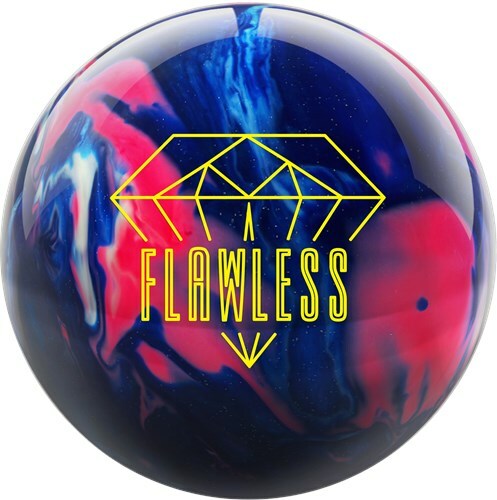 Hammer offers flawless performance with the Hammer Flawless mid performance bowling ball. The combination of the Juiced Pearl coverstock and 40 Watt core result in good length and strong backend motion when gliding through medium oil conditions. This bowling ball is Carbon Fiber Infused! Carbon fiber is one of the toughest materials on earth. Hammer decided to add this material to the inner core of this ball for added strength and durability allowing them to offer an incredible 3 year warranty. The Flawless is a great add to the Hammer line. The Juiced Pearl Coverstock wrapped around the new 40 Watt core is a great combination. The Flawless gives you good length down lane, but the symmetrical core makes sure it does not fly past the breakpoint. Out of the box, this ball will need some dry to assist with the transition. Likes: The Flawless to me when I opened it was blah. It looks like a pretty ball and to me that isn't tough which is what the Hammer brand is known for. After watching a few videos and reading up on it, I decided to put the pin under the ring because its symmetrical and shiny which for me usually means I see some skid. That is something I did not need in the bag right now because I like to see the ball controlled and more rolly than anything - Predictable. I drilled it and threw the first couple test balls and my jaw dropped. I could not believe what this pretty ball was doing on the lanes. It became real tough in my eyes right away. It was filthy. It was dirty. It was tough. It was FLAWLESS! This ball fits right into the Hammer Brand. Not only because its tough and rolls so nice, but because it hits like a tank. It has a controllable, blendable, smooooooth reaction that doesn't quit. It's so good, it makes your bad shots look FLAWLESS! Do yourself a favor and get this ball. You will be surprised and amazed and most of all, glad you have this ball on your side! Video will be up soon. Likes: Easy length, strong off the friction. Has a strong, predictable backend motion and has a nice look to it. I hear many compliments about the sparkle in it. Don't let the pretty look fool you, this ball is nasty down the lane and hits hard. Reminds me of a Onxy Vibe on steroids!! Likes: I used Pin Down Dual Layout 60 x 5 x 70 no hole. I love how it clears the fronts and nice strong arcing motion on the back end. Really happy with this Mid Performance ball. It really hits and the colors are eye catching. Page created in 0.776 seconds with 23 queries.